Crowley Maritime Corp. christened the U.S.-flag combination container/roll on-roll off (ConRo) ship MV Taíno today in San Juan, where the company’s investments have ushered in a new era of world-class supply chain services in the U.S. mainland-Puerto Rico trade. 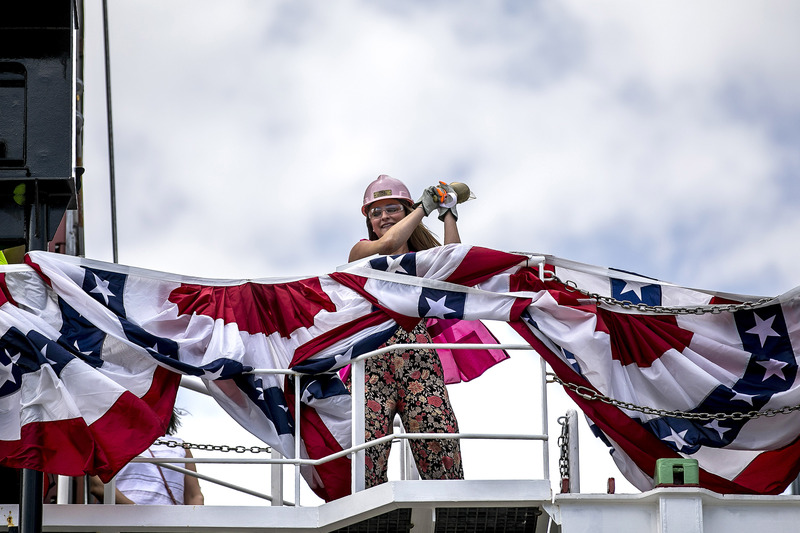 Clara Crowley, daughter of Chairman and CEO Tom Crowley and board member Christine Crowley, served as the ship’s sponsor and broke the ceremonial bottle of champagne on the bow of MV Taíno at the company’s Isla Grande Terminal before several hundred employees, customers and dignitaries. 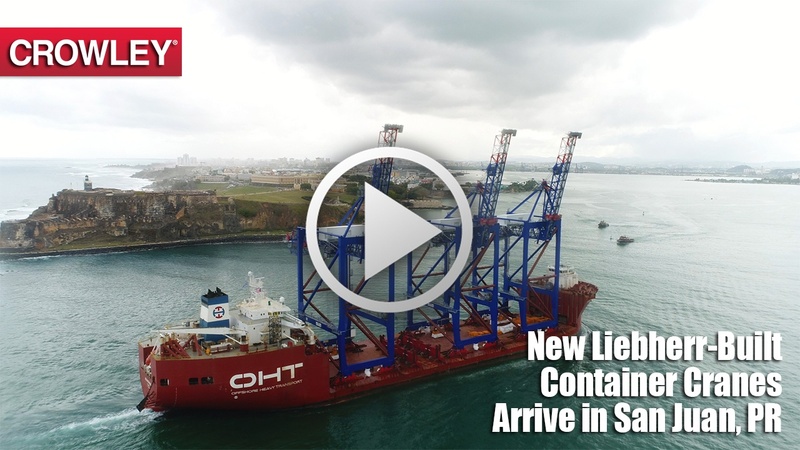 It was the first time a container ship had been christened in San Juan in recent memory. 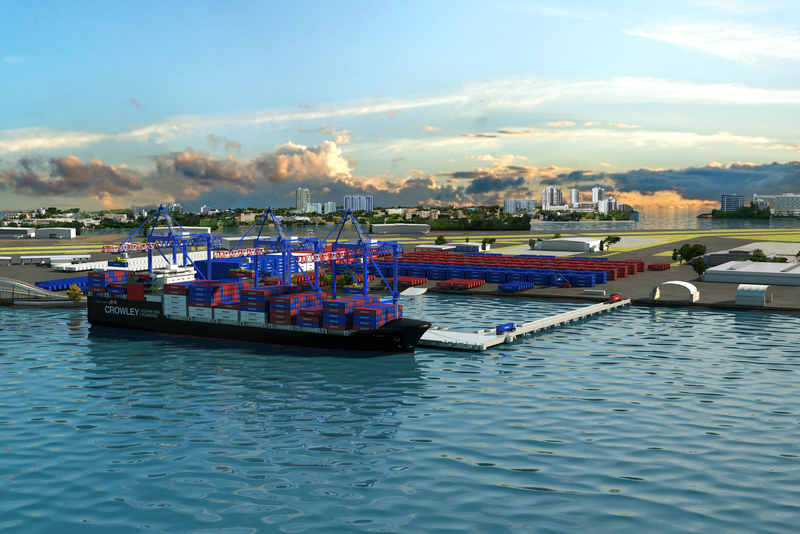 It’s no secret that Crowley is making infrastructure improvements to its Isla Grande Terminal as part of a $550 million investment in the company’s Puerto Rico services. Of importance are three ship-to-shore container cranes, which will be used to load and unload containerized cargo carried aboard Crowley’s two new, Commitment Class combination container/Roll-On Roll-Off (ConRo) ships, powered by liquefied natural gas (LNG). The 65-meters tall Liebherr container cranes are some of the most technically advanced, ship-to-shore gantries in operation nearly anywhere today. Photo: The first Crowley container is lifted by new cranes from the barge. In late June, Crowley celebrated the arrival of the first vessel to call at its newly constructed pier at Isla Grande in Puerto Rico – the Crowley-towed container barge 455-4. The occasion allowed Crowley to put its three new container cranes and equipment to work for the very first time, and both operators and cranes performed well. Crowley’s Chairman and CEO Tom Crowley recently spoke about the company’s liner and logistics strategy and the $550 million investment Crowley is making in its Puerto Rico and Caribbean business at JAXPORT’s Logistics and Intermodal Conference, held in Jacksonville this past spring. In this video, listen to Crowley’s key remarks on these topics, as well as the company’s burgeoning liquefied natural gas (LNG) business that is now supplying industrial customers throughout the Caribbean Basin with an efficient, reliable and affordable fuel source. 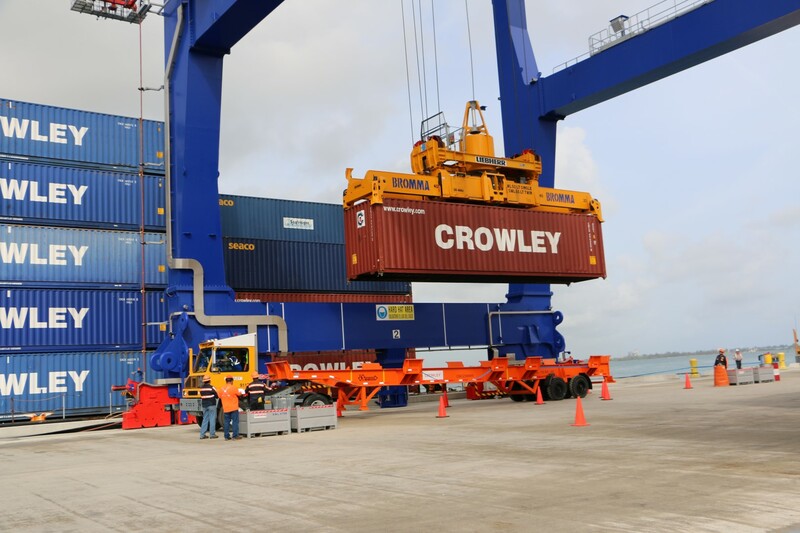 The three new, ship-to-shore cranes that were constructed in Ireland were delivered to Crowley Puerto Rico Services’ Isla Grande Terminal in San Juan on Wednesday, marking a historic milestone, which was captured on video, for the company and island. 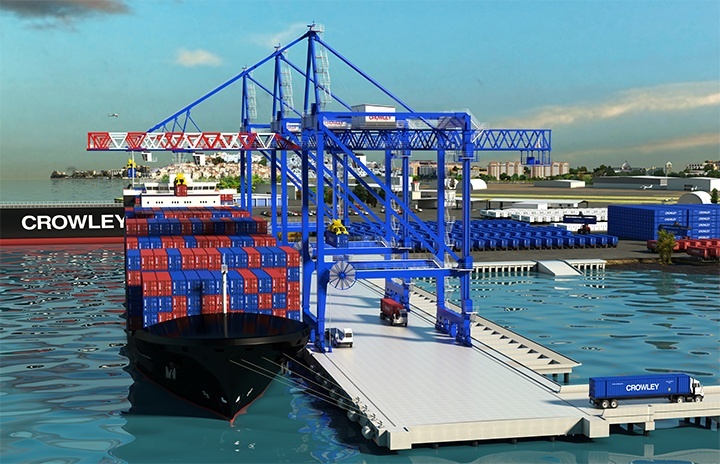 The cranes are a key element of the $130 million Crowley is investing in infrastructure improvements to its Isla Grande Terminal, and their arrival marks the first time new, specialized gantry cranes have been received for operation in the San Juan Harbor in five decades.